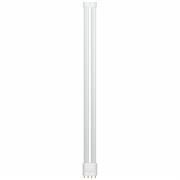 LED PLL lamp direct to mains for maximum efficiency, direct wiring to AC Mains Only. Ideal for multiple commercial applications. Must be wired to AC mains, not compatible with any ballast. Featuring a full glass body with same dimensions as CFL PLL. No mercury or hazardous materials. Instant start with no warm-up time.